The Troy USAF GAU-5/A/A is a reproduction of the classic service rifle used by the USAF. The USAF version of the XM177E2, the GAU-5/A/A utilizes a 'slick side' A1 upper receiver and pencil profile barrel. 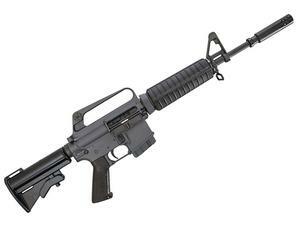 Features include an A1 profile lower receiver with "Property of U.S. Government" engravings, DoD Stamp, "Full Auto" selector markings and a faux auto sear pin.